Who Should Buy Burial Insurance? The short answer to this question is; everybody. However, I am sure that you are after something a little bit more in-depth than this. On this page, we will look at some of the reasons why you need to get protection. Firstly, if you have life insurance already, you might still need to have burial insurance. You will, of course, need to check the terms and conditions. Some life insurance policies will cover your burial. If it not, you can always get in touch with a company that offer funeral plans. To get you started, we can assist with this part. We offer funeral cover quotes from top providers in South Africa. At What Age do I Need to Get Burial Insurance? In our opinion, everybody over the age of 65 must burial insurance. Yes, people are dying older nowadays. However, sadly, it is impossible to predict exactly when you are going to die. However, we always recommend that a person has burial insurance in place, no matter their age. Generally speaking, the vast majority of people over the age of 65 will find it difficult to get life insurance. This is because there is no benefit to the insurance company. It’s a risk offering insurance to people at this age. After all, they make their money when people don’t die whilst they have their policy. Over the age of 65 you are, obviously, closer to dying than the day that you were born (sadly). Therefore, at this age, burial insurance is going to be your only benefit. If you can, you should try and avoid pre-paid burial insurance. It tends to be more affordable but often offers fewer benefits. The only time we would really suggest that you go down the route of a pre-paid burial insurance is if you are over the age of 76. Below that, get a normal policy. This way you are not going to have to worry about your policy benefits. Generally speaking, a long-term insurance policy will probably work out cheaper..
As I mentioned previously; if you are under the age of 65 then you really should be opting for life insurance instead. However, I do know that for some people this can be expensive. If you can’t afford a whole life insurance policy you still have options. You should, instead, try and purchase burial insurance. It is going to be cheaper at a young age. It is, obviously, going to be less likely that you will die at such a young age. A policy will at least give you confidence knowing that your family have protected. Anybody can die at a young age. After all, if you are unable to afford a life insurance policy, it is unlikely that you will have the money sitting around. You will need to have money in your bank account to cover the costs of a funeral. 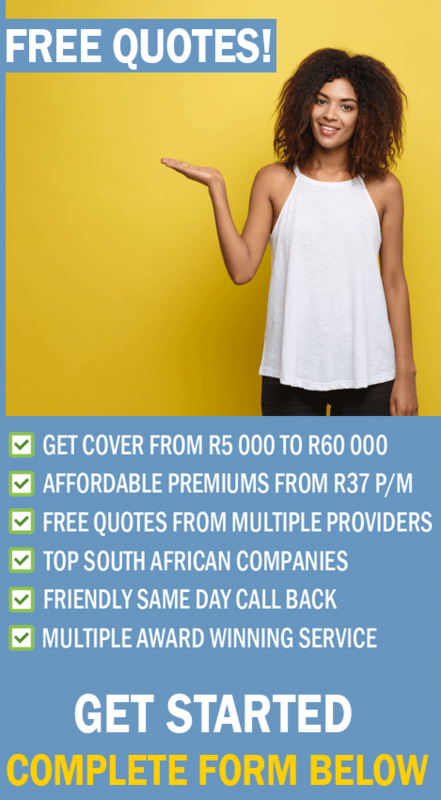 To get free funeral cover quotes in SA, all you need to do is complete a contact form on our website. A consultant will phone you with all the information. We represent AVBOB, Metropolitan & Discovery funeral cover.